One of the all-time classics. 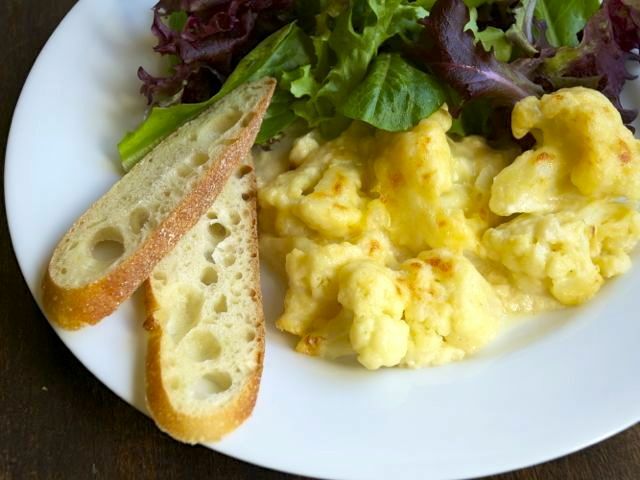 For macaroni and cheese: Make a double quantity of sauce, cook 3 cups macaroni, and combine the two. Put in an oven dish, top with bread crumbs, more grated cheese, and a drizzle of oil and bake until golden. Put the milk into a saucepan with the onion, bay leaf, and peppercorns. Bring to just below simmering, then turn off the heat. Let stand for at least 30 minutes, an hour or two if possible. Preheat the oven to 375 degrees. Meanwhile, cook the cauliflower in a pan of boiling salted water for 3 to 4 minutes until almost tender but still a bit al dente. Drain well, allowing it to steam for a minute or so, then keep warm. If the milk has cooled completely, warm it gently before straining it into a pitcher. Melt the butter in a medium saucepan over a fairly low heat, then stir in the flour to form a smooth paste (a roux). Cook gently, stirring frequently, for 1 to 2 minutes. Remove from the heat and add a third of the warm milk. Stir vigorously with a wooden spoon, or a whisk, until you have a thick, smooth paste. Add the rest of the milk in one or two lots. Return the sauce to the heat and bring to a boil, stirring. Let it bubble for 2 minutes, stirring occasionally, to "cook out" any raw taste of flour. Turn the heat down. Set aside about ¼ cup of the Cheddar and add the rest to the hot sauce, along with the Parmesan, if using, and mustard. Stir gently until the cheese has melted into the sauce; don't let it boil. Add salt and pepper. Combine the cauliflower with the hot cheese sauce, gently folding the florets into the sauce until well coated. Transfer to a greased ovenproof dish, scatter the remaining cheese over the top, and bake for about 20 minutes, until golden and bubbling. Serve as a main dish course, with bread, or as a side dish. Variation: Chardy Cheese. In place of the cauliflower, use 1 1/2 pounds Swiss, ruby, or rainbow chard. Separate the stalks from the leaves. Blanch the leaves in a pan of boiling salted water for a minute or two, until just wilted. Remove with tongs, drain, squeeze out excess water, and chop coarsely. Cut the stalks into 1/2-inch-thick slices and blanch for 3 to 4 minutes, until just tender. Drain well and toss with a tablespoon of butter and some salt and pepper. Put the stalks in a greased ovenproof dish. Stir the chopped leaves into the hot cheese sauce and pour over. Scatter with coarse bread crumbs and a drizzle of oil, and bake as above.